I have no problem with the cliché that Paris is the city of intertwined couples, art that will move you to tears, and food that you'll never want to stop eating. I happily embrace it. The only problem is that every time I go, I have the time of my life, discover myself anew, and then come home utterly depressed. Could it be the city's markets filled with local cheeses and chickens with their heads still on? Or the quaint bistro in the 17th arrondissement that serves a casserole-size terrine of pate as an appetizer? Or maybe it’s biting into a croque madame served with a near liquid egg on top. Sadly, it’s all those things, which is why when I returned last week to my frozen lunches at the office, I had an existential crisis the size of Paul Bocuse's chef's whites. When I thought about what I had enjoyed the most, my mind raced back to the croque madame we had at Cafe de la Mairie in the sixth arrondissement across from the Saint Sulpice. 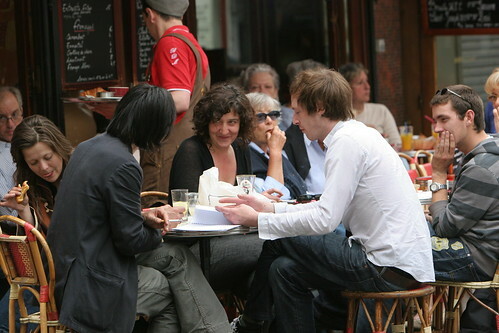 The cafe, which is a hangout for writers and publishers and was a favorite haunt of the late French author Georges Perec, served us a croque madame made with a single slice of bread from the French master baker Lionel Poilane and topped with thin slices of smoked ham, Gruyere, and a glistening, barely-cooked egg. When we broke the yolk, the liquid spilled out onto the plate, moistening the toasted bread. While researching this dish, I tried a version made with two slices of bread and bechamel sauce. The classic butter and milk sauce is essential to provide enough moisture if you're squeamish about semi-cooked yolks, but I loved the simplicity of the Cafe de la Mairie version with the one wet yolk moistening the bread. Place the oven rack about 10 inches from broiler. Turn the broiler on high. Butter each slice of bread. Place one slice of ham on each slice of bread. Layer each slice with Gruyere cheese. Broil for about 4 minutes. Heat a nonstick pan over a medium flame. Coat the pan with about a tablespoon of melted butter. Crack each egg into the pan gently, so the yolk doesn’t break. Cover the pan for one minute. Uncover, and cook for two more minutes. Slide each egg on top of each slice of bread. Season the egg with salt and pepper. Garnish with tomato slices. To make it a full meal, serve with a lightly-dressed green salad. *Pain de campagne, or "country bread," is typically a large round loaf made from a natural leavening that is similar to American sourdough but not as sour. Hi, sweetie, I get hungry again just looking at the pics! I loved Paris more after each time I visited. Each time another layer is unfolded and wonderfully discovered. 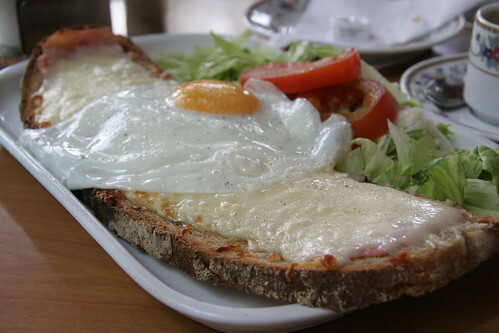 This Croque Madame takes me back to the L'Opera area, merci! Peter: That's so true about Paris. Walking through the city is like reading a great book. You never want it to end. Cheers! yep, don't mind me, i'm just licking the yolk off the plate. oh is this my computer screen in the way? ayaaa. i want to go to paris again. such lovely memories. Great food, great city, great pics! Oh yes yes yes. Or better, oui oui oui ;) I love absolutely anything with yolk on it...who says egg on your face is a bad thing?! This looks fab. Sarah: I'm with you -- who says you can't lick your plate? Ladonisbleu: Yes, me too! I've never gotten tired of Paris yet. THAT will be the day. Thanks for stopping by. 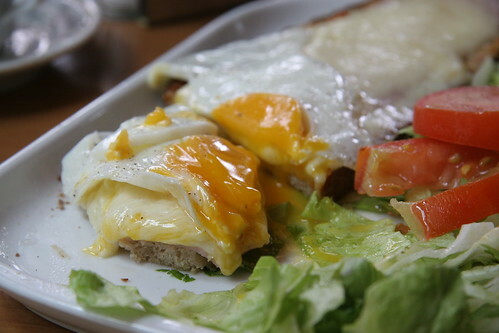 Good Mood Food: It's a special thing, that first croque madame in Paris! Glad you enjoyed. Thanks for visiting! S for KC: Thanks! I'm glad you liked the pics! Bleeding espresso: I agree, I just love the yolk part of the egg, especially when it's just barely cooked! What a wonderful blog you have! Paris is definately oe of my favs too, I could walk and walk wand walk for hours just soaking in the beauty - but I have to stop FREQUENTLY to eat! Mmmmm...Thanks for this post, it made my day on so many levels. Paris...Poillaine...n'uff said. And that beautiful croque madame takes me back! Great therapy for all of us. hehe. 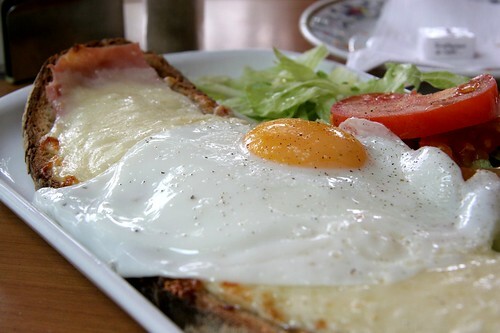 oh goodness, the picture of the croque madame is just...heavenly. This is one of my favorite sandwiches and to be able to eat it in Paris like you did is a dream! thank you for sharing the dreamy and delicious pictures, I can't wait till the day that I can make it there! Simply gluten free: Thanks! I'm glad you like the blog. I love walking Paris too. It's a great way to soak up the city AND burn the extra calories you eat while there! Mark: Thanks! I can see from your blog that we share of love of eggs in France. Beautiful posting! Zen Chef: It has got to be one of the best comfort foods in the world. Add a layer of Paris mystique and voila! The perfect dish. White on Rice: Hey you two, thanks for stopping by! Agreed. Eating ze famous 'croque' in Paris is a must! That looks like a really nice lunch! Thanks, Kevin. I love it for breakfast, lunch, or dinner. I just switch out the espresso in the morning for white wine in the afternoon or evening! Wow this looks fantastic. That egg is just perfect. It is seriously beautiful! Lurve it! Thank you for those pics. No Recipes: Thanks! Yeah, getting the egg just right is like toasting pine nuts -- you can't turn your back for a minute -- but it's well worth the effort! Cathy: Thanks! Glad you like the photos! I love recreating dishes from holidays too! That fried egg looks gorgeous! 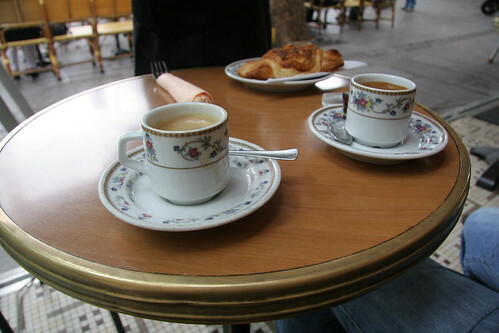 wow, this pictorial just made me really miss france. i don't know if that's a good thing or a bad one! We are Never Full: I hear ya with the missing France thing! It seems to be easier when it's farther away in my mind. :) Thanks for visiting! Really lovely. I visited Paris as a little girl and I still fantasize about how magical it is. Your pictures are beautiful... but it does bring on a sense of depression! This is why I work as a chef and part-time at an artisan cheese shop! I have to get my fill of French decadence on a weekly basis. 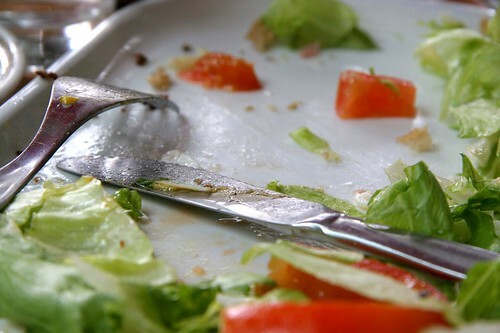 Your blog is fantastic... a gem in the monotony of "food/cooking/travel" blogs. Genuine and touching. Thanks Punch-Drunk Cook! Your comment made my day. And I'm glad to know there is a community of foodies who need a French food fix more often than not!